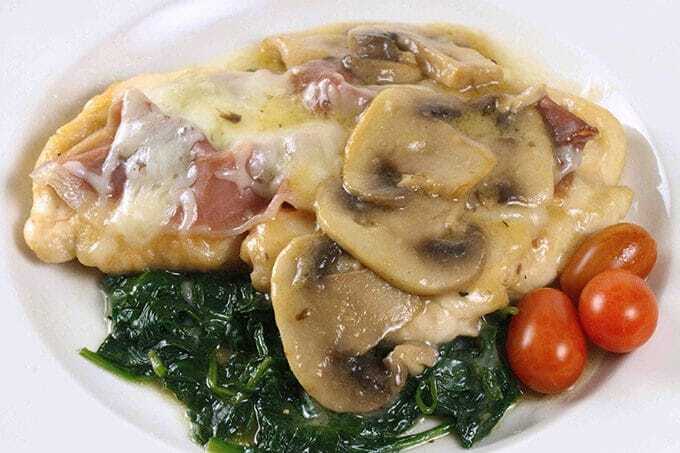 One of my favorite dishes to prepare during my restaurant days was a Chicken Saltimbocca, it contained different components that came together in a symphony of flavors that truly did “jump in your Mouth”, at least according to the literal translation! When I first started in the kitchen saltimbocca was made with veal, but these days chicken has replaced veal in just about every dish it used to be made with. Some of the ingredients we use in restaurants have very specific purposes, while others are fillers used to bulk up a dish without bulking up the cost. 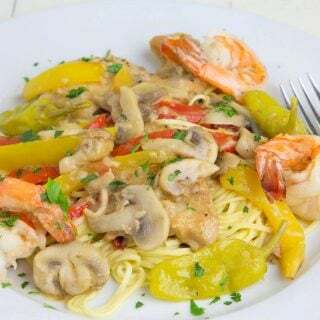 Mushrooms have always been a favorite of mine for this purpose, and or course pasta, rice or grains take up a lot of room on the plate and can a meal much more enticing. Chicken Saltimbocca could easily be served over pasta. For my first entry into My Restaurant Kitchen I’m making one of my favorites chicken saltimbocca, it was always one of my more popular dishes, no matter where I worked. I hope you enjoy it as much as we did! place floured breasts in a large saute pan with enough olive oil to saute chicken breasts. Cook chicken 3 minutes on each side and remove from the pan. serve with rice or a grain of your choice. ;*you can use mozzarella instead of fontina, this will keep the cost down. * sweet marsala will have a nuttier flavor and makes a much better sauce, everyone will tell you to use dry, I never have. Pellingrino is the best Marsala if you can find it. Hi Dennis, I want to make this for my daughters engagement party, to serve 25-30 people. Can I make trays of this the day before and then bake for dinner time next day. Can I make the sauce early or at serving? If it’s possible how would you do it? 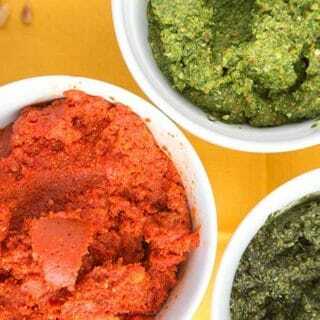 For that many people what’s the best accompaniments? This is a great choice for a party. I would oven roast the chicken breasts (season well) undercooking them a little so they can finish in the oven. You can make the sauce ahead of time if you need to, and reheat it at the time of service. It will thicken, thin it out with more marsala or chicken stock when you reheat it. Put the chicken on the baking tray, add hot sauce, top with prosciutto and fontina finish in 350-degree oven for 10 minutes. Place on top of the spinach when you move it to the serving dishes. I would do either mashed or roasted potatoes and a nice salad, either Cesaer or Garden. Roasted potatoes can be cut, oiled and seasoned ahead of time, then placed in a 350 oven 35-45 minutes before you finish the chicken. Hi Chef, I also would like to make this ahead of time – I’m planning to bring it to Xmas dinner, and need to make enough for about 20 people. Just to clarify, would you recommend doing everything up ’til step 11, and then finishing the dish in the oven, re-warming the sauce? Thank you!!! I would cook the chicken till its almost done. You can grill it, cook it in the oven or saute it. Season the chicken well before cooking. Cook the spinach ahead of time or before serving whatever works best for you. Make the sauce on the stove top and when you’re ready to serve put it together and finish it in the oven, adding the sauce before serving. This is a great dish for groups. While my note is many years past the original posting date of your recipe, I thought I’d still throw in my comments. I have been making Chicken Saltimbocca now for, gosh, over thirty years, and it’s always been a favorite of my family. I learned to construct it a bit differently, but I doubt it makes a huge difference in taste, if at all. After pounding the breasts flat, I place the prosciutto and cheese on top of each breast portion, then roll them up snugly, tucking in the edges and ends, securing each with toothpicks. I give them a quick egg wash before dredging each in a fresh breadcrumb/flour/parmesan/sage mixture and pan fry in an unsalted butter/olive oil mix over medium to medium high heat until a light golden brown before transferring to the baking dish. Several members of my family have never acquired a taste for spinach unfortunately, so I’ve had to substitute there. I usually toss asparagus spears with olive oil, fresh squeezed lemon and sea salt before grilling them to a crisp-tender consistency, then fan out 5 to 7 spears under each breast for plating. Everything else is practically identical, including the idea of adding the mushrooms!! Yummmm…. thanks for your comment Belle and I’ve always said recipes should be guidelines and easily adaptable to our own tastes. Thanks so much for sharing your version! My husband fell in love with me when I made this. I served it over wild mushroom ravioli! I am trying to figure out what I am missing. The recipe is basically strong, but the cooking times are ridiculous. If you pound the chicken breast to the thickness shown in your photo of the plated dish your cooking times of 5 minutes per side & 15 minutes in a 350 degree oven would produce chicken jerky. I sauteed mine around 1 1/2 minutes per side & 5 minutes in the oven. Tell me what I am missing. your right Bob, you can definitely reduce the cooking time, I do saute over a medium heat as high heat tends to toughen the meat and as for the oven time it says about 15 minutes or until the cheese is melted. Whatever works for you is good. yes you can , just don’t cook the chicken all the way, I would top it with everything, reserve the sauce. heat it up at 350 for 15 minutes or until 165 degrees then top with the hot sauce when you serve it. Thank you so much for letting me know! I’m happy to hear you enjoyed it! Oh my, this looks fabulous! Definitely going to try it soon. Fontana cheese is hard to find here, any thoughts on a good substitute? I have used Mozzarella, that works well with the dish, you just want a cheese that melts well and doesn’t over power the dish. mm. I love chicken Saltimbocca, but mine is never as pretty as this! I was searching for a recipe for this and found yours. I know it will be fantastic so this is the one I’m going to make! Thanks Maureen! I hope you enjoy it as much as we do! I made this tonight for our Friday night supper. We loved it. Thanks so much. Thank you for letting me know! I am so glad to hear that you enjoyed it! Love how you’ve presented a restaurant-style dish for home cooks! I try to avoid boneless skinless chicken breasts, but my kids love ’em. IMHO, pounding them is the way to go to for even cooking and tender texture. 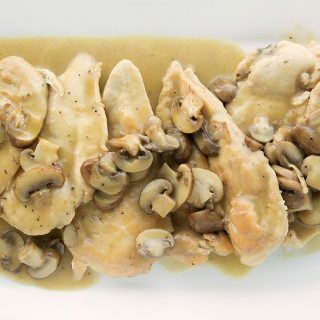 I’ve never cooked with Marsala and would love to give it a try. I’m not feeding a restaurant or a school, just my family of five. We also have a lot of relatives and we are always hosting dinners and parties at our house. Actually, maybe I am a restaurant? But, I pay for it all!! I have an extra fridge in the garage specifically for stocking up on meat that’s on sale. Whole roasting chickens for 69¢/pound, B/S chicken breast for $1.88/lb, tri-tip for $1.99/lb…. and on and on. I only pay full price during an emergency cooking situation! Lovely recipe! Loving this new segment! Of course the dish is delightful!! I feel your pain on grocery prices. Sigh. I love the new series chef. Thank you for generously sharing your skills and knowledge. Homecooks like me appreciates the learning I could get from your series. It will help me infuse a littlle sophistication into our daily cooking. I know my family will enjoy new dishes that I could get from here. I’ve never heard of beurre manie. How can you be sure the sauce doesn’t have that raw-flour taste you get if you don’t cook a rioux long enough? your not putting that much flour into the dish, like with a roux. I have been using this method for 30 years without ever having it leave a raw flour taste. If anything you get more of the butter flavor, the flour just helps pull it together. The trick is just pushing flour into the outer part of the butter, kind of rolling it in the flour while getting as much in the butter as you can. I’ve used this with all types of dishes and sauces. Beautiful dish Chef! I am floored by prices lately – and not just on chicken. But on everything. I read a report earlier in the year about the inexcusable increase in markets over the last five years and how it is just going to continue to rise. Nothing like stimulating the economy huh? It’s just the two of us 99% of the time here, but I always buy in bigger packs and break them down into portions we can use – freezing the leftovers. It just saves in the long run. Can’t wait to see what your bring us next! Great new segment, and a fantastic meal to start with. I think I will be making this one soon. I’ll be following your new segment with interest and good luck. One thing is sure that photography will be excellent. My mouth is watering I do not care for sage what could I use as a sub? i would just leave the sage out, my wife doesn’t like it either and it comes out great! One of the first things I ate when I moved to Rome was saltimbocca. I thought I had died and woken up in heaven. It truly was one of the most amazing flavors i had ever tasted. Over the next ten years I explored the entirety of Italian culinary genius, but you never forget your first time, right? Thanks for the memories, chef! Congrats, of course, on the Top 9! This is my kind of recipe! Great idea of a series. This is awesome. Great first entry Chef Dennis! I am so excited to see how this new portion of your blog is going to go. You always have the best tips and are so very thorough. Thanks for being awesome as always! Your chicken looks very tasty. I think I should try this and try it very very soon. I love the mushrooms on top. One of my favorite ingredients with chicken. Your food recipe and layout is an art! Congrats on being Foodbuzz #1!! E’ Da un po’ che non passavo a farti visita, il tuo nuovo blog è a dir poco favoloso. Ho appena letto le tue ultime due ricette, sono favolose, ora vado leggermi cosa mi sono persa. this a great new feature that will help all of us out in the culinary sides of our blogs and kitchens, I’m always looking for another new chicken recipe. Congrats on the Top 9 today! I love your idea for this new series. I used to work in restaurants (front of the house) but always wanted to get a chance to work in the kitchen too. Now, I only cook for my small family of four, but I think I still take what I learned in my restaurant experience when I’m cooking for my family. I am always looking for something new to do with chicken. Thanks for the idea and a great post!!! In someone’s restaurant, I understand sometimes needing to be more economical. But the only cooking of animals that i respect is one that is done with organic, free-range (hopefully local) chickens. They may cost an astronomical amount, but it’s worth it. This dish does look amazing and I can’t wait to pass it along to friends. But I will also suggest that they get animals that have been treated properly… no matter what the cost is. I do understand your point Brian, and while I wish it was always possible to buy free range meats, I can’t always accomplish this. I wish there were more sources and more of a market for the products which would help bring the prices down. Free range and organic should be the first choice of any shopper, choices shouldn’t have to be made because of pricing. Thank you for making a very valid point, I always appreciate your comments. Oh heavens, that looks delicious Dennis! I have never tried Chicken Saltimbocca; not sure why. But looking at this and reading the recipe, It is going on my menu for this weekend. Dennis, this sounds amazing! I can never get over the mark-up–it’s pretty ridiculous. Who wouldn’t like this? It is Great recipe, and you made fantastic photographs, making this meal even more appealing and delicious! Thank you for sharing! I think ‘In my Restaurant Kitchen’ is a great idea! Can’t wait to learn from you. Have a wonderful day! Chicken is also expensive in Toronto. I love mushrooms, and have some I need to use right now, so this recipe came to us just in the nick of time. It has all the flavours both my hubby and I love! Great post, Chef!!! I have been wanting to make some chicken saltimbocca for a while since I saw it on a magazine cover a few months ago. Now after seeing yours, I need to make this SOON! I love this new segment on your blog! What you said about the price of chicken is so true. I buy ours in bulk and just freeze it! I loved this new feature, Chef! This is going to be fun. I have made a version of Chicken Saltimbocca that is completely unlike yours. While we love our version, yours looks even better. I cannot wait to give yours a try. With the mushrooms and the cheese and marsala, my husband will hurt himself when I serve this. Thanks so much for sharing it! It’s getting pinned for sure. Chef Dennis, once again you have actually made my mouth water! I can not believe how amazing this looks. I adore mushrooms and I’m pretty certain this might be the most tempting dish I’ve seen in a long time. I love this new section on the blog! That is a tasty looking dinner! I see there’s some spinach under there, I absolutely adore spinach and think it would go very well with the cheese and mushroom of this dish. Morning! I like the new segment and the recipe! Kudos.. I really enjoyed your new segment! I’m able to find chicken for $1.88 a lb but it comes in 8+ packs and there tends to be lots of waste. It’s surprisingly tender and delicious though compared to the organic, no-additive, no antibiotic chicken that I used to buy at the posh store that seemed to be always dry and have a strong chickeny flavor to it. Dish looks great and right up my ally – I’ll have to make it sometime. I love mushrooms! Waste as in fat trimmings, not throwing away chicken…I freeze it and pull it out as needed. Thanks! I knew what you meant but not everyone might, I do buy my chicken in bulk packs too, its a great savings in price! And don’t forget those trimming can help make a good chicken stock! That is the tastiest looking saltimbocca I’ve ever seen!! Printed off to try. Always a joy to visit your blog, Dennis! Saltimbocca is such a great dish. I always think there is a reason why dishes last such a long time. I never really thought about how many dishes we make from a set of Mise en Place. An excellent idea for a series. I love the new segment. Sharing your experience makes for great reading. 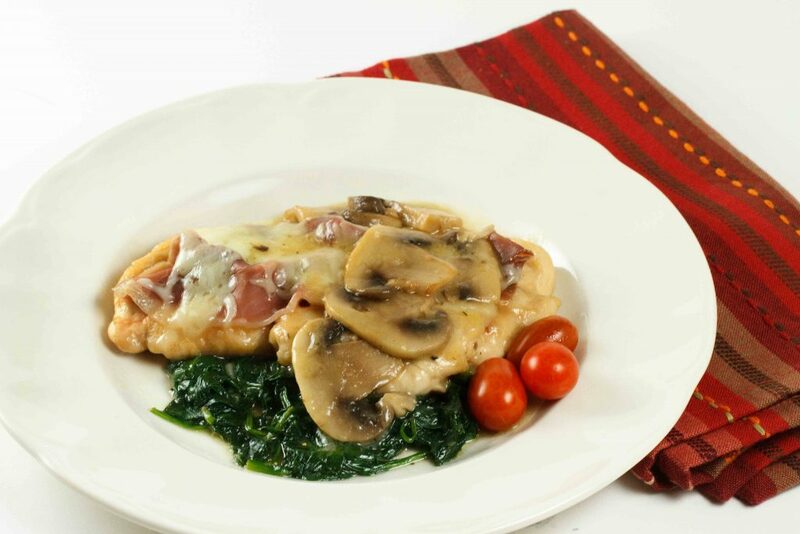 The Chicken Saltimbocca looks amazing and will be on my table very soon. What a great way to kick off your new segment! 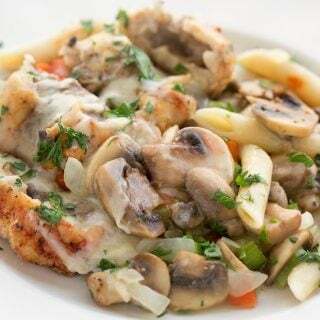 I love chicken saltimbocca and yours looks so good! Great first segment Chef Dennis. My only issue is none of us like mushrooms. Could I substitute something else in it’s place? I am going to enjoy getting to know the ins and outs of the culinary world. Keep them coming my friend. I love reading your blog. you can leave out the mushrooms all together, that’s not a problem. As for adding something else in it’s place, I don’t see to many items filling in for the mushrooms, and since we already have spinach on the plate, it would be fine without them!